Many years ago (probably close to 10 years now that I think about it...) I was introduced to my holy grail moisturizer. It was so rich, and luxurious. And it was one of few that actually worked on my dry, red, face. A woman at a cosmetics counter who was working for the same department store I was, actually recommended that I try it, since my mom and I were trying to find something that worked for me. The woman told me that the brand was Shiseido, and although it was marketed as night cream for older women, she told me to try it during the day. I got a sample, and off I went. Little did I know, this would be the one. Immediately I felt relief. My skin didn't feel dry, or tight. It didn't burn. The moisturizer worked. I went and purchased a full size bottle. It was on the pricey side, I believe either $62 or $68 Canadian, for 40mL. I did get an employee discount as well. But who cares - it WORKED. This holy grail for me, was Shiseido's Benefiance Revitalizing Cream N. It was more on the thick side, but I applied it during the day and night. It worked well under make-up, and would give my skin a dewey look. It moisturized perfectly for me. I found that Sephora carried the same moisturizer on the website, yet I couldn't get it shipped to me due to some Canadian shipping rules, or whatever you want to call it. I continuously bought this miracle cream for years, until one day, I found out it was discontinued. My heart sank. This was the only cream that worked. What was I supposed to do?! I continued to purchase some through eBay when I found it, but slowly the selection dwindled, and I just couldn't justify spending $60 on a small bottle of moisturizer anymore. The hunt was on (and still is...) to find the perfect moisturizer for my skin. Something that works well for dry skin. I find a lot of creams just tend to sit on the top of my skin, and don't absorb. It's horrible to look like a grease ball, but the skin feels so dry inside. I remembered that I had left a review on Sephora's website for this specific moisturizer, and recently logged in to find that the same review I had left for Shiseido Benefiance Revitalizing Cream N, had been moved to a different product. 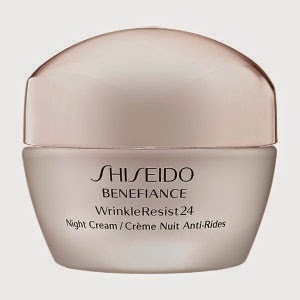 This new product was Shiseido's Benefiance WrinkleResist24 Night Cream. It was the same price as the older version, so I asked if they were the same, and if the name had just changed. I was advised that they were the exact same product. So since I had a gift card to Sephora, I went in and grabbed the WrinkleResist24 night cream. Let me tell you. They are NOT the same. This new version is thinner, and not as rich. I knew immediately that the scent was different, even the look of the cream was different. I decided I would try it anyway, because maybe it would work. Sadly, the new WrinkleResist24 Night Cream just didn't work for me. It rolls off my skin sometimes. It's not as thick, and it doesn't feel like its being absorbed into my skin. It feels like it wears off pretty quickly too. So disappointing since it was over $70 with taxes. I ended up sending Shiseido an email asking them what exactly they carry that would be compared to the older moisturizer I loved, and they told me it would be another line, and it retailed for over $100 before taxes. I'm sorry, but I'm poor. I can't afford a bottle of moisturizer that is that expensive, and I don't even know for sure if it will work for me. So I say, BOO. Boo to changing the formula, for discontinuing Benefiance Revitalizing Cream N. PLEASE. BRING IT BACK! I have pretty much a quarter of a bottle left of the original formula, that I have been holding onto, because sometimes my skin turns into havoc dry mode, especially in the winter, and this is the only thing that helps. I'm going to post the ingredient list that I can find for both products, and maybe if you guys know, what ingredient is it exactly that just seems to work. I'm really interested in finding something else that may have the same ingredient that will work for me! ･Developed with Shiseido-exclusive Anti-Photowrinkle System, consisting of aquatic plant extract Chlorella, to counteract the appearance of future wrinkles. I guess because it has been discontinued in a lot of countries, it can't find the ingredients in a Google search, and it's been so long, I no longer have the box. Shiseido Benefiance WrinkleResist24 Night Cream (Newer purchase) - Water, Glycerin, Hydrogenated C6-14 Olefin Polymers, Petrolatum, Cetyl Octanoate, Dipropylene Glycol, Squalane, Microcrystalline Wax, Maltitol, Dimethicone, Disteardimonium Hectorite, PEG-150, Polyglyceryl-2 Diisostearate, Sodium PCA, Tocopheryl Acetate, Potassium Ascorbyl Tocopheryl Phosphate, Arginine HCI, Ginseng Extract, Sodium Acetylated Hyaluronate, Hydroxyproline, Chlorella Vulgaris Extract, Polyvinyl Alcohol, PEG-12 Dioleate, Butylene Glycol, Trisodium EDTA, Alcohol, Sodium Hexametaphosphate, Tocopherol, Ethylparaben, Butylparaben, Fragrance, Iron Oxides.